Poetry of the Heart and Soul expresses a deep emphasis on expression and is particularly aimed at the goal of not letting anything hold you back from your creativeness which burns inside you mind, heart, and soul. 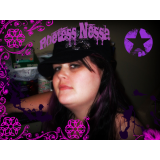 The expression of poetry presented here is unique and freelance written, varying from different times and places within Poetess Nessa's own Heart and Mind. With her dedication and ever striving longing to make it as an author, it is clear this dream has now been accomplished. May you enjoy the fruits and labors of love givin in key expressions of the poetesses mind.